How can you be aspirational and grounded in reality at the same time? Aetna needed a tool to showcase their future app, explain its functionality, and motivate its sales force—and they needed it fast. The tool needed to balance realistic functionality with futurist blue-sky thinking in order to both inform and excite the national sales reps about a product that would not fully be available until 2018. Knowing that the sales reps would be on tablets and not always able to connect to wifi, as well as not having the ability to download apps to devices, we created a web-based app that preloads and functions seamlessly on a mobile devices. Aetna’s goal was to show an entirely fresh human experience of engaging with their healthcare insurance provider in the 21st century. For this product, we created four narrative journeys based on typical Aetna customers. 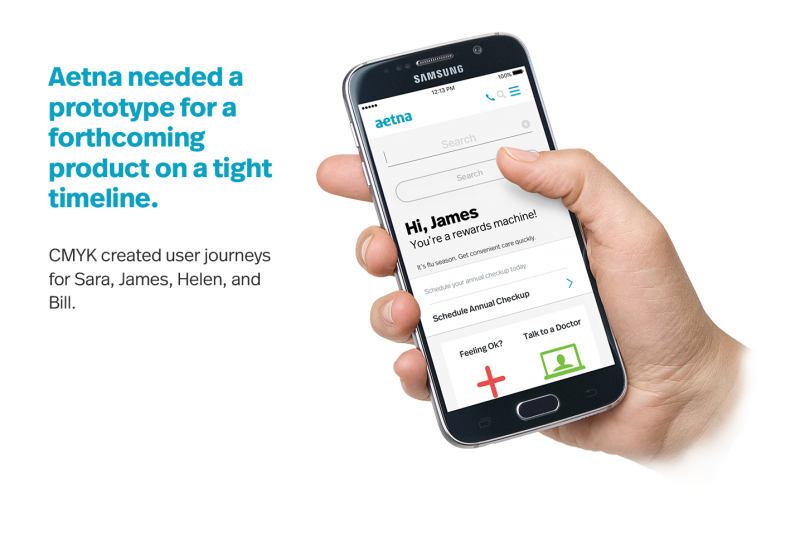 After fleshing out the user scenarios, we were then able to design and develop four “Member Journeys” to not only show what the experience would be, but also how Aetna’s future app will fit frictionlessly into your life. The final product was a a show-stopping presentation for the national sales conference that is currently being rolled out and used by Aetna’s national sales team.